The husband-and-wife team behind developer Kijome won’t soon forget its first day on the Macworld/iWorld show floor. It helps that the company’s BigDay iOS app is built specifically to help folks remember important days in their—and their friends’—lives. You can enter in the birthdays for your friends and family members, along with other important dates like anniversaries and such. 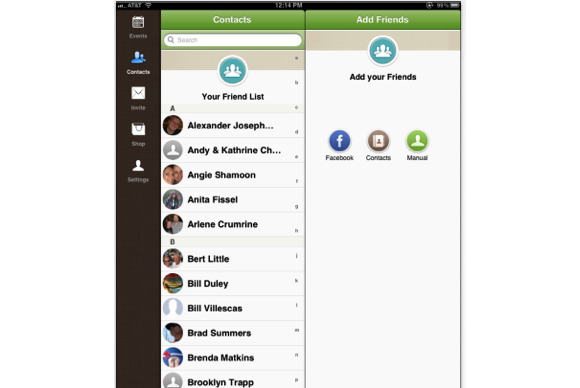 You can also invite friends to join you in using the app, via email or Facebook. When your friends install the app and enter in their own data, you can optionally see the important dates that they enter for themselves. The app automatically sends you push notifications two weeks before the big days you’ve saved in it, and gives you additional alerts as the day gets closer. But it’s not just a glorified calendar. BigDay can also help you figure out which gifts to buy—and you can do your shopping from right within the app. What’s more, your friends who sign up with the app can even tell you which stores they crave gifts from; BigDay includes more than 500 such stores. BigDay is free; Kijome makes money on affiliate links to the stores it includes within the app. The app requires iOS 5 or later.